Most of the yard owners I talk with say they are not having any trouble getting junk cars at a fair price. We all remember when the prices were through the roof. This was great when you were selling your loads of crushed cars but it was extremely difficult to buy scrap cars. It seemed that everyone in the world was in the scrap business and they were out competing with you to buy every clunker out there. Enroll in our monthly newsletter. 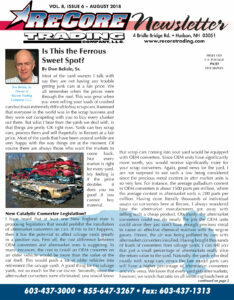 We will mail you our monthly newsletter about what is new in the industry and our business.